Ald. 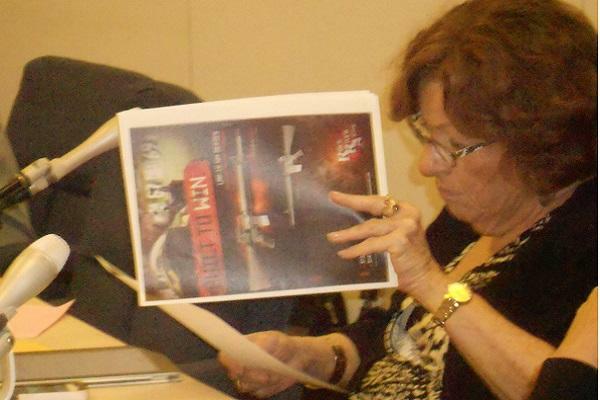 Ann Rainey (8th) looks over a pamphlet handed out by an advocate for gun rights at Monday's City Council meeting. An assault weapons ban was introduced as an effort to put in place gun regulations before the state's concealed-carry law possibly restricts local governments from doing so. The introduction of an assault weapons ban pitted gun hobbyists against advocates for fewer firearms at Monday night’s City Council meeting. Backed by Evanston Mayor Elizabeth Tisdahl as a step toward a safer community, the ordinance would ban the display, sale and possession of guns with a high-ammunition capacity and fast shooting rate. Recreational gun owners and military veterans criticized the proposal, saying it would outlaw the safe use of firearms. A debate ensued among residents about the effects a ban on assault weapons could have on decreasing violence in Evanston and communities in larger areas such as Chicago. National Rifle Association instructor Blair Garber said he is ready to bring a lawsuit if the council passes the ban, which he views as restricting the legal rights of citizens. He also invited residents who want to learn how to shoot a gun to free lessons, drawing hushed whispers of distate from a few people. The ban would allow Evanston to put new gun regulations on the books before the state’s rewritten concealed-carry bill possibly prevents it from doing so. Tisdahl is a member of Mayors Against Illegal Guns, one of 28 mayors in Illinois organized by Chicago Mayor Rahm Emanuel in favor of more gun control. “I do ask the people against the ban: Would you trade your target practice for the life of a child?” Murray said. Also at Monday’s meeting, The Evanston 4th of July Association presented its plans for this year’s celebration. The city provided an additional $10,000 for the parade on Central Street, and the organization matched those funds, funneling them into 23,000 shells for the afternoon fireworks show by the lakefront. In addition, the council approved a special-use permit for a child resale store called Kazoom in Evanston Plaza, which has been designated a TIF district to revitalize the largely vacant lot on Dempster Street. Aldermen also unanimously voted for approval of a liquor license to Kingston Grill, 1164 Dodge Ave.